Is your hospital’s reception area in need of a makeover? Do you have your eye on safe and durable bariatric waiting room chairs for hospitals and other healthcare facilities? More and more people are experiencing obesity across the globe, and as this service-user group continues to emerge, it’s important that healthcare providers meet their needs too. For this particular patient, bariatric care extends to all facets of his or her life—both in the home as well as in the hospital setting—therefore prescribing and advising patients on suitable furniture to meet their needs should reflect that. Bariatric waiting room chairs help to accommodate patients during that transition from home to a healthcare facility. Given the amount of time a patient will be sitting down or lying in bed, chairs and beds will be a patient’s most often used pieces of equipment. While undergoing therapy, many obese individuals need physical help as they move from a standing to sitting position and back, or as they’re being placed into mobility equipment. With the right beds and chairs, these users get the support they need at key moments of transfer in order to keep them mobile and active throughout their care. By selecting the most appropriate furniture for bariatric care, manual handling risks during patient transfers can be minimized, while the quality of life for the patient is maximized. 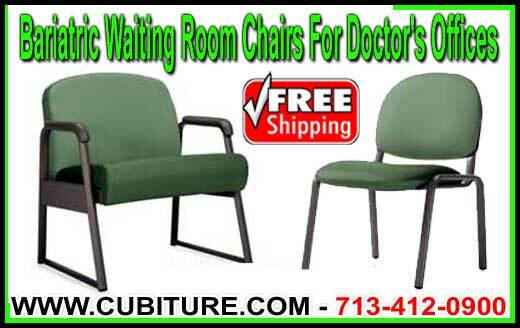 We have an extensive array of bariatric waiting room chairs here at Cubiture. We understand that it can often be a headache to decide on a supplier for bariatric seating for your healthcare environment. That’s why Cubiture gives all the information you’d need for any of the products that we offer. To learn more, contact our customer support today. Both caregivers and specifiers will be amazed at the variety we offer among our bariatric waiting room chairs. With more than 40 versatile models, we don’t just offer style and appearance. We also offer maximum comfort to patients, whether they require either acute or long-term care. Our chairs are the height of durability and toughness, with frames of reinforced steel or hardwood, both in a variety of finishes and engineered to withstand 750 pounds of weight. Chairs are available with seat widths of 30 inches, a standard in bariatric seating. Tamper-proof connectors are available for mental health or correctional facility applications. Easy grip while getting in and out of our bariatric waiting room chairs is accomplished with such features as urethane or wood armcaps or injection molded polypropylene arms. Seats and backs are made from foam to give comfort and support to the back and neck. Waterfall seat edges can help with circulation in patients’ legs, and easy cleanout is guaranteed with seamless cushioning and spaces located between seat and back. We also have bariatric waiting room chairs that are designed specifically with the ease of patient transfer in mind. Like our other chairs, these models have a frame made of durable material and are built to withstand 750 pounds, but they also come complete with rear casters and push bar for easy movability, trigger-released fold-away arms, and height-adjustable legs. These chairs are available in flex-back models and in black, tungsten, toast, or platinum finishes. If you’re looking for a seating solution that gives a feel of uniformity to your healthcare waiting room while also making the most of your space, we have multi-seating configurations that seat up to five guests in one unit. Tabletops between our bariatric waiting room chairs are a common feature with bridged multi-seating configurations, giving patients some personal space and a place for their belongings. Wingback bariatric waiting room chairs are also available. Bringing the warm feel of home to the waiting room while attending to the needs of patients in a bariatric care setting, our wingback chairs feature an adjustable cushion for neck support, integrated lumbar support, and forward-grasping wood or urethane armcaps. They can even be accessorized with a matching ottoman. They come in a wide range of finishes as well, depending on the style and décor of your hospital waiting room. If you believe that it’s important to make a positive first impression on potential clients and other visitors to your building, then look no further than Cubiture for the right furniture. Our bariatric waiting room chairs give your guests the support they need as they wait in any lounge or reception area, whether it be in a healthcare facility or otherwise. You can explore Cubiture’s whole catalog of comfortable, cushioned bariatric waiting room chairs for easy integration into your hospital or clinic environment. Each of our chairs isn’t just designed with comfort and style in mind, but also eco-friendliness; we make use of materials that are sustainable that leave a small environmental footprint. To receive a free quote in product pricing, make sure to call us today!